The issue of immigration is a conversation where various modes and narratives of bigotry have a foothold on U.S. North American Identity. The constant evolution of "American Identity" causes significant consternation in sociocultural discourse to the point of doubling down on the interlocking oppressions which are a necessary tool for an imagination rooted in inequality for the sake of capital. Into this fray comes race and gender, traditional grounds of oppression. I am told to apply for a job as a man and then you will get a job since you are really a man and not a woman. The ignorance overwhelming, I tell the person I am not going to discuss this with you right now. Clearly the person is ignorant of the inner feelings of identity. My reality is that at times I feel like a light skinned black person who can pass for being white told out of frustration just say you're white and you would have a job. So, what does it mean to inhabit the in-between? To fall in the middle of definitions? I inhabit a land that clamors for definitions, a type of home if you will. A space where the would-be citizen can live out their life. Ostracizing and othering anything and anyone, the would-be citizen develops terms and conditions of agreement for their safety and security, necessarily creating a space of privilege. As a person who longs for oneness of heart and soul, even peace I am an alien in the land. The statements above represent a mindset encountered that tends to dehumanize myself and those similar to me. It is a very narrow, restricting mindset grounded in a theology that emerges from a cave oriented mentality. This particular orientation empowers certain fear based endeavors which become structures of survival for a group, sect or demographic of people. As I graduate from Starr King School for the Ministry with a Masters degree in Social Change I continue the long yet hopeful struggle to liberate myself and others from this debilitating hopeless fear based reality. 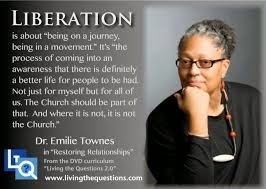 To live and develop, as Dr. Emile Townes states, "An awareness that there is definitely a better life for people to be had not just for myself but for all of us." Let's be frank, inviting people into a new and liberating consciousness is an endeavor deeply rooted in faith. That said, liberating people, one on one or in community can be scary, difficult work, a risk of life and limb, yet if we love the humanity of God, and I believe this to be a critical difference between traditional and more progressive theologies, that we are God's humanity then justice must inhabit all aspects of our cultural, social, and political discourse. This perspective becomes a critical pivot point at the ballot box as people vote their theological and doctrinal stances regarding issues that effect all aspects of society. Political discourses on race, gender, sexuality, politics and economics are profound conversations on identity rooted firmly in theological discourse which bestows a particular legitimacy upon mere opinion. Theology, whether traditional or progressive, and the ballot box have been intimately engaged in a struggle for liberation from the beginning of the republic. The questions posed by this blog post are, "What does your theology support?" This is the question that has been partnered with me along this journey of ever increasing awareness. A parallel question emerges as Life, with all of its love asks, "Are you aware?" The goal of theology must be an ever increasing awareness of who I am in relation to the divine and in this sense it is a liberative discourse. That said, my political stance becomes a particular evidence of my own theological work. Fighting for liberal progressive policies such as increasing the minimum wage or the Affordable Care Act (ACA) or Obamacare, which aim at a more just and equal society, I encounter those who have a vastly different mindset on such things. Having lived and even embraced what I consider a more traditional theology of colonization and empire, where identity is a tool of production and economy, I am mindful that this theology is powerfully rooted in intimate notions of fear and scarcity interpreted as permanent fixtures of survival as determined by capitalism, the engine of the American empire. Identity then more than anything else is interpreted through fear and scarcity, and is necessarily reflective of a theology which experiences God through doctrine necessarily engaging in limitations, even restricting and constricting divine presence. Statements such as, "The Bible Says. ", "The word of God for the people of God" or any gendered language of God becomes just another tool of indoctrination to further empirical notions of being. Walking today through an area of the City or Richmond known as the flatlands I encountered a man who looked at me with hatred in his eyes, who made violent gestures toward me. Now, he was not the first person in Richmond to do this and certainly not the last. Looks and stares, the shaking of the head even the wagging of the finger have been a part of my journey for as long as I can remember. For a moment, remembering the Transgender Day of Remembrance, I am mindful that he and those like him think what white supremacy has taught them to think,even how to react. No thoughts or reactions of their own, only experiences constructed and designed by and for white supremacy. They live, breath and move in the spirit, emotion and physicality of empire. This is the very mindset I stand against theologically as well and politically. In some respects this may be why the mindset of the U.S. tends to lean towards the right, as leaning towards the right leans toward empire, i.e. white supremacy and in this sense appeasing the empirical ego. White supremacy, also considered a structure of indoctrination, exhibited by the man I encountered on a Richmond Street, presents Jesus, the resurrection and the bible as sequestered elements and terms of idolatry, necessarily fostering the goal of empire for a vast plantation culture. These elements and terms then becoming a ground of enslavement for the sake of some unity based on pseudo christian themes of salvation, i.e., subtle notions of oppression. In contrast I believe that the more we come to know Jesus, the more we become aware of our liberation and therefore an enemy of the empire and state. Walking through the flatlands of Richmond, I find that my liberation in Jesus Christ has become an affront even a critic of normative mindsets and sensibilities of a community with many churches, police and poverty. An intimate portrayal of oppression and the call to break the chains of white supremacy emerges as one more man is gunned down and murdered while driving his truck on a freeway in Richmond, California in broad daylight. The police have yet to catch any suspect. - Henry K. Lee, SF Gate, May 4, 2014. The murder of one man on a busy freeway becomes an experience in search of meaning in the realm of human interaction. A profound loss to family, friends and coworkers, his murder presents life as an intense and intimate context of fear and oppression enfleshed with acts of violence seldom understood. This act of violence, while grotesque and unsettling, is a peculiar evidence of the intimate aspects of relationships and community in a society where violence is more often than not a mediation of identity. Violence, in its various forms, is a primary discourse and means for maintaining those margins which reveal the boundaries determined to be critical to definitions and terms created to maintain and project social, political, military and economic power. A new Jim Crow, more cunning and devious, considered here as a projection of white supremacy, is alive and well seeking to shape, shift and deceive an emerging demographic narrative to maintain power as Willie Lynch invests in a new and diverse caste system. In this context intimate portrayals of oppression arise as voter ID laws, hard won civil rights and affirmative action policies under attack, an overcrowded prison industrial complex, an irrational fear of the non white immigrant, a supreme court seemingly in bed with corporations, and individuals who, at times, let the proverbial “cat” out of the bag, reveal a violent mindset reminiscent of the days of the southern slaveocracy, the runway slave and Bull Conner. What we have here is a recalcitrant white supremacy suffering from pathological narcissism and a longing for a new, diverse and glorious plantation culture. In the face of this violence hope becomes a powerful outpouring of the moan, and the cry of a people who long for justice. Hope is that prophetic voice heard and felt deep within the soul of people the world over, who exist within a matrix of oppressions perpetrated by a lust for money, corporations, and the politics of systems which have determined, since colonial expansion, that the one and only way of survival is the way of white supremacy. I ask the reader, “Is there no other way to survive except the way established by white supremacy?” That said a reading of the words of Rev. 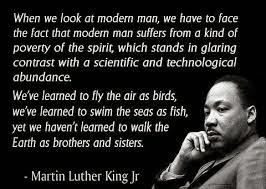 Dr. Martin Luther King Jr. illicit thoughts of creating and developing a different imagination of access to resources and as such survival. Beloved, we must understand the connection between one man's death on a busy Northern California freeway, and those structures created and developed by and for white supremacy which lead to those acts of violence. We must change the rules of the game. If, like King, we allow our faith to live, new ways of access will emerge beyond that which has been dictated and authorized by white supremacy.